January 10, 2017, New Delhi, India: Service Charge has become a major issue of contention as most hotels and restaurants are levying this charge in their bills. It has become a norm and some consumers do not even know that the service charge is nothing but a tip that is being taken from them. As the issue has multiple ramifications and affects many consumers, a survey was undertaken by LocalCircles, India’s leading citizen and consumer engagement platform. 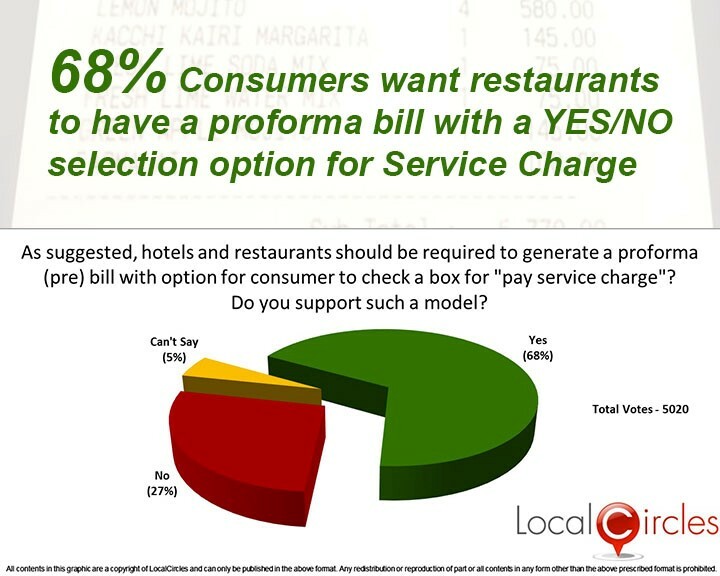 Majority of the consumers have voted in making Service Charge optional and 68% consumers have opted for restaurant bills to include a YES, NO check box for Service Charge. The final amount charged to the consumer should be based on their selection. Over 5000 consumers from over 120 districts of India participated in each one of the 5 polls and over 26,000 votes were received in this survey. This exercise was conducted after the Ministry of Consumer Affairs issued a notification on Jan 2, 2017 stating Consumer has the discretion to pay “Service Charge”. 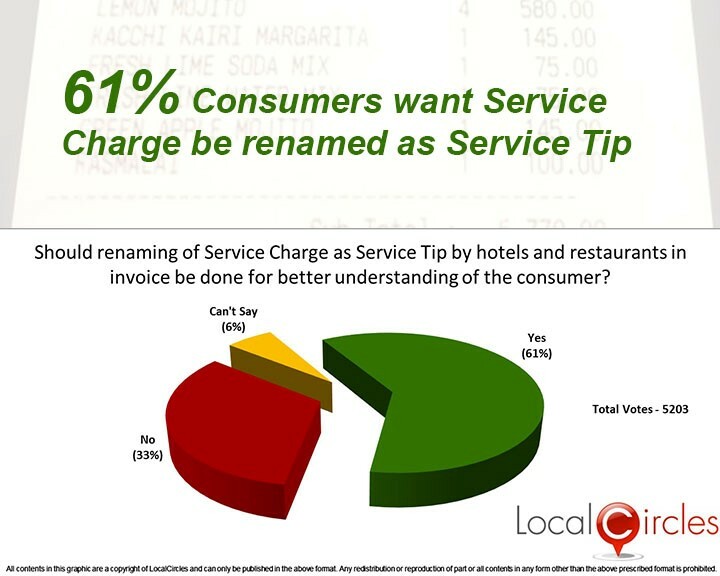 The first question in the survey was on should renaming of service charge as service tip be done for better consumer understanding where 61% of consumers agreed to this change. Another 33% did not agree to this, while 6% did not comment. Technically, the service tip is to be paid to the serving staff and not to the management of the restaurant. Therefore, the next question was about the utilization of the service charge collected. 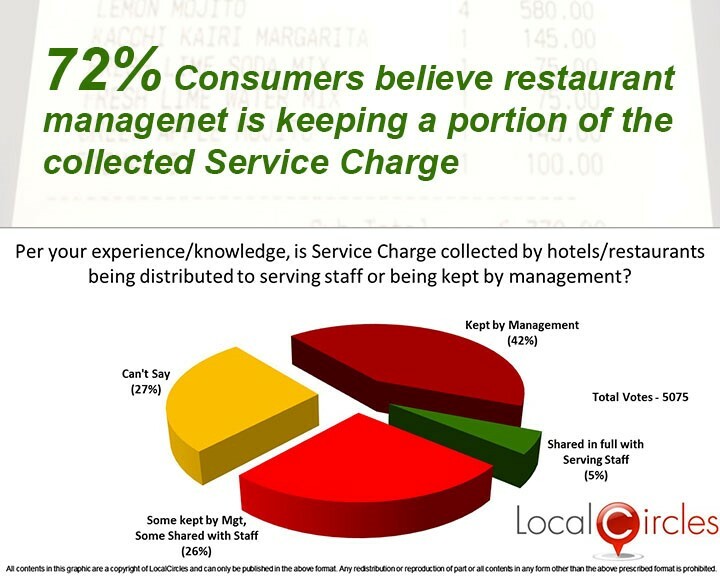 Almost 42% of them believed that the service charge is kept by the management, 26% felt that some part of it is shared with the staff, while only 5% of consumers believe it is shared fully with the staff. This means that the distrust with the collection and utilization of this charge is very high among consumers. The rationale offered for levying a compulsory service charge on all consumers by restaurants is that it ensures that a tip is paid to their serving staff. But as a tip is considered as voluntary and has to be a choice that consumers should exercise. 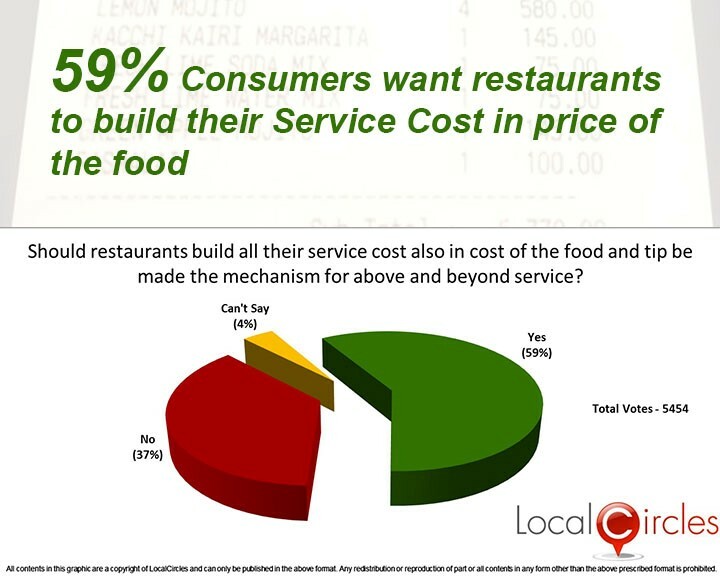 LocalCircles asked the question whether all service costs should be incorporated in the food cost or main bill and the tip be made purely a voluntary thing. Majority 59 % of the consumers said yes to such a move, while 37% objected to it and 4 % were non-committal. 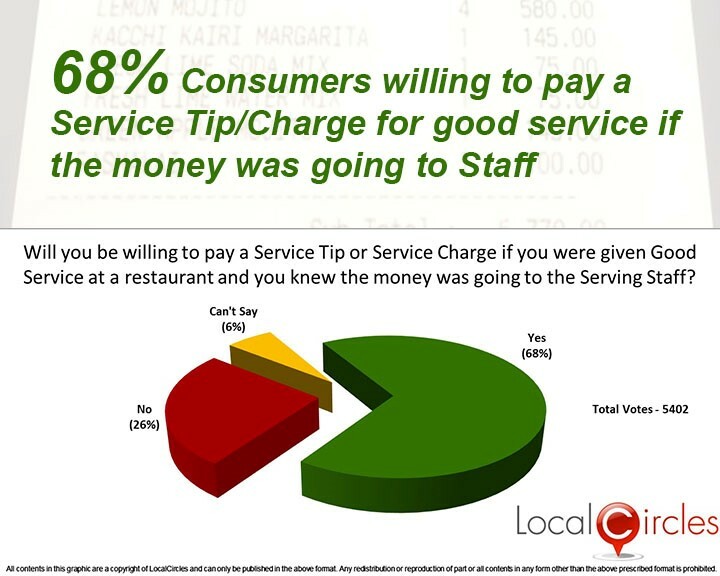 Almost 68% of the consumers are willing to pay a tip to the serving staff if they feel the service rendered to them as good and if the tips are going to the staff. Only 26 % of the consumers are not willing to pay the tip, while 6% are indecisive. 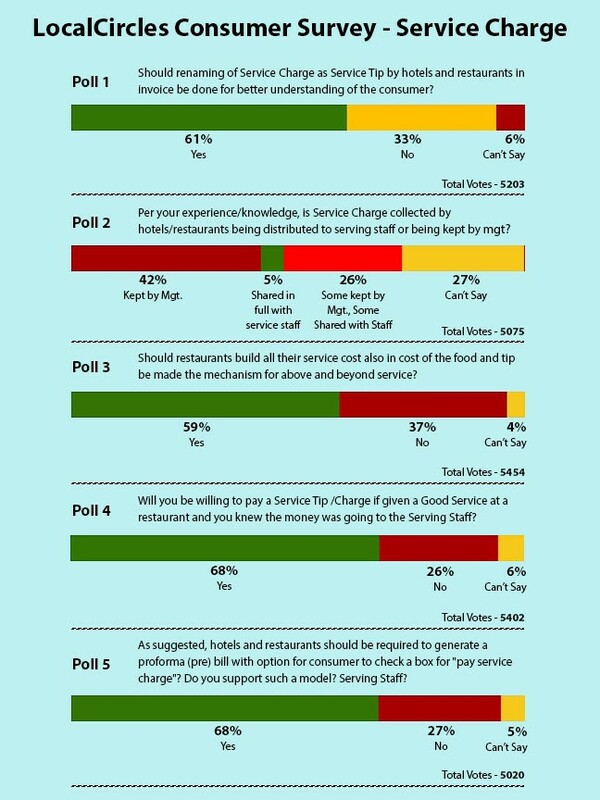 This means that majority are in favour of paying a tip, but some establishments have made the tips compulsory in the form of a service charge. To make the payment of the tip a choice and voluntary exercise, the final question was on should consumers be offered the option to pay the tip before the bill is generated. An overwhelming 68 % supported such move while 27% opposed it and 5 % said "Can’t Say". 8. Major awareness campaigns must be undertaken at Central and State Government levels to educate the consumer.